“Dialogue” has become one of the core notions to address fundamental issues of present time, such as cultural and religious plurality, and more generally to come to understand as well as to practically deal with diversity and differences. This issue of Teoria collects contributions, both invited and selected by means of an international Call for Papers, addressing dialogue from different perspectives and disciplines. The aim of the issue is to provide the reader with a selection of current theoretical and practical perspectives on dialogue, and to offer a broad picture of the complex range of definitions, meanings and practices connected to it, also giving voice to critical and intersectional positions. After a reinterpretation of dialogue in classical Greece (Serra), some contemporary perspectives are offered to connect the reflection on authors with that on general topics, such as the fundamental notion of subject (Falzon), the relationship between dialogue and power (Monceri) and the dialogic encounter with the beyond-human world (Keating). The subsequent articles are devoted to some dialogue theories as elaborated by important authors, highlighting both their epistemological foundations (Biondi, Lillebø) and their implications for relevant fields to which dialogue is currently applied, such as interreligious dialogue (Vendra, Tumminelli). 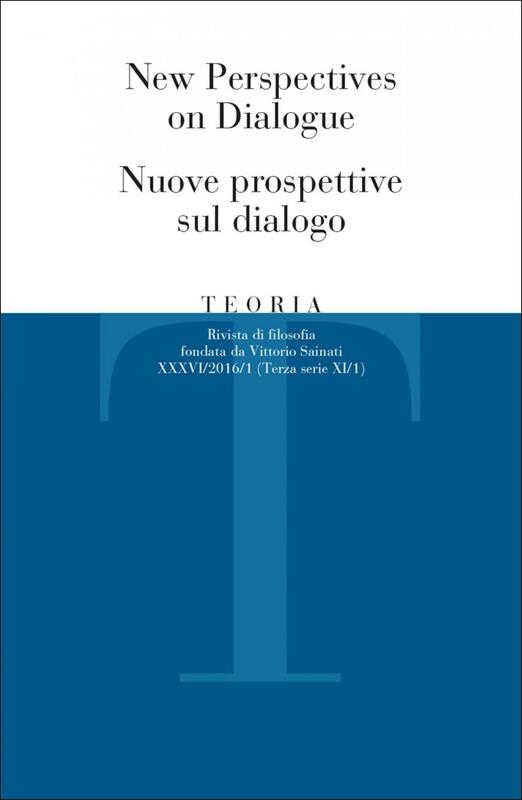 The last two articles address some relevant aspects of the dialogical practice (Brivio and Bertolino, Plass). Il concetto di “dialogo” è divenuto centrale nel trattare questioni fondamentali del presente, come la pluralità culturale e religiosa, e più in generale per cercare di comprendere e di affrontare praticamente la diversità e le differenze. Questo fascicolo di Teoria raccoglie contributi, sia invitati che selezionati sulla base di un Call for Papers internazionale, che si occupano di dialogo a partire da differenti prospettive e discipline. Lo scopo del fascicolo è fornire al lettore una selezione di prospettive teoriche e pratiche attuali sul dialogo, nonché di offrire una panoramica del complesso spettro di definizioni, significati e pratiche a esso connessi, dando voce anche a posizioni critiche e intersezionali. Dopo una reinterpretazione del dialogo nella Grecia classica (Serra), vengono presentate alcune prospettive contemporanee che connettono la riflessione su autori con quella su tematiche generali, quali la fondamentale nozione di soggetto (Falzon), la relazione fra dialogo e potere (Monceri) e l’incontro dialogico con il mondo oltre-umano (Keating). I successivi articoli sono dedicati ad alcune teorie del dialogo elaborate da importanti autori, sottolineandone sia i fondamenti epistemologici (Biondi, Lillebø), sia le implicazioni per ambiti rilevanti nei quali il dialogo è attualmente applicato, come il dialogo interreligioso (Vendra, Tumminelli). I due articoli conclusivi affrontano alcuni importanti aspetti della pratica del dialogo (Brivio e Bertolino, Plass). English title: Towards an agonistic conception of dialogue: a neo-sophistical approach. The aim of my paper is both historiographical and theoretical. From the historiographical point of view, it proposes a reconsideration of the opposition between Socratic and sophistic dialogue with specific reference to one particularly important aspect: the idea that Socratic dialogue is oriented towards reaching truth, while the sophistic one has the only aim of success or rather, to be right. However, from a theoretical point of view, starting from the characteristics attributed to sophistic dialogue, it aims to show how it is possible to outline a theoretical frame which is more suitable for the practice of dialogue in a society like the present one which, to quote Rawls, faces the fact of pluralism daily. At the heart of the method proposed by the Sophists is the idea that dialogue has an intrinsically agonistic dimension. From this perspective, however, it is not a question of renouncing the notion of truth. As I try to demonstrate, the Sophists’ practice of dialogue is oriented contemporaneously towards truth and success. Keywords: agonism; sophists; Socrates; truth; success. A certain notion of dialogue provides a useful perspective not only for reading Foucault, but understanding the notion of subjectivity that emerges in his thinking. The subject presupposed by dialogical power relations is neither wholly transcendental nor simply a product of power. It is both affected and affecting, passive and active, a finite transcendence. This can be distinguished from Sartre’s superficially similar idea of human being as facticity and transcendence. Sartre situates the self only insofar it is reinstated as radically transcendent. Reflective activities, the focus of Foucault’s later work, inform a more complex picture of human subjects, as not only shaped as an active being but brought to actively shape themselves. But at the reflective level also, human subjects are not mere products. They can be active in their self-shaping, refusing themselves in order to create different forms of subjectivity – the critical self-relation appropriate to Foucault’s subject of dialogue. Keywords: Foucault; Sartre; finitude; transcendence; dialogue. The attempt to separately think dialogue and power is doomed to fail, since power is a characteristic feature of interactions between humans. In this article, I try to argue for the need to more deeply consider the role of power in dialogic interactions if we are to get full advantage of the practice of dialogue in the different and complex situations in which it takes currently place. I firstly consider the idea that in order to correctly perform dialogue power should be removed, as it has been suggested among others by William Isaacs and Daniel Yankelovich. Then, I consider the case of deliberative democracy and the objections moved to the “political dialogues” it envisages. Lastly, I give a preliminary hint as to the ways through which the opposition between power and dialogue might be no longer considered as such. Keywords: dialogue; power; deliberative democracy; William Isaacs; Daniel Yankelovich. Drawing on work by Gloria Anzaldúa and other women-of-colors theorists, this article suggests that by positing a deeply relational worldview – a metaphysics of radical interconnectedness – we can develop and enact innovative dialogic encounters with the beyond-human world. Defining the world as “ensouled” and her surroundings as sacred and sentient, Anzaldúa establishes a meaning-saturated, participatory relationship between herself and all existence. This relationship is dialogic, enabling her to read the world for information, guidance, and direction. It is argued that this dialogic reading practice is a transformational decolonial process that offers vibrant alternatives to Cartesian philosophy’s anthropocentric, dichotomous ontology and epistemology. Keywords: animism; Anzaldúa; decolonization; dialogue; metaphysics. Keywords: Bohmian dialogue; knowledge; radical constructivism; learning. This article discusses the concept of dialog from an epistemological and an ethical angle. Its main focus is to see dialogue in the light of relations and ask what kind of relations dialogues could open for and should open for. I discuss the implications the concept of dialogue and relation have on how we can think the subject in dialogues. In order to do so I look at three overlapping approaches: the first is to discuss whether the prepositions to (relation à) and between (relation entre) marques a significant distinction for the understanding of relations in dialogues. The second is to complement the analysis of prepositions, relations and the subject with a discussion of a “diacritical hermeneutics”. In the third approach reflection on how dialogues might be a way of harbouring a conflict of interpretations in a constructive and productive way. Keywords: Epistemology; ethics; hermeneutics; relation; Ricoeur. The benefits and problems of religious plurality concerned Paul Ricoeur. Through reference to his thought, my essay seeks to give an ontological foundation to interreligious dialogue reflecting on its theoretical form. Following a Ricoeurian analysis of human ontological disproportion, its plural condition, and the «captive free will», I first attempt to show the constructive role that religion plays in human life. More precisely, I demonstrate the impact of anthropological structures on interreligious dialogue, focusing on the positive possibility of interfaith encounters. On the other hand, confronted with the fact that people to this day continue to kill “in the name of God”, I try to understand why religion’s susceptibility to violence exists and how we may try to eliminate it. Here I rely on Ricoeur’s hermeneutical anthropology of the suffering and capable self. Interreligious meeting entails a long effort with a limited range of possibilities that needs our constant work to save the essential value of cohabiting together. Keywords: interreligious dialogue; hermeneutics; anthropology; fallibility; alterity. English title: Dialogue and community of life in Martin Buber’s ontology of relationship. Martin Buber’s ontology of relationship can be considered one of the most important and significant theories of dialogue elaborated by contemporary philosophical thought. Its most evident feature is the ability to connect, in a very effective way, the theoretic reflection of philosophy with practical aspects of the ordinary life of human beings, thus establishing an inseparable union between ethics and metaphysics. In this article, the author investigates Martin Buber’s dialogical reflection to understand how it might be translated into a concrete attitude towards others and the world. The theory of dialogue becomes, in this way, an existential praxis that involves all the concrete aspects of a person’s life, being at the same time embodied in the relationships that everyone lives in their own community life. Keywords: dialogue; community; Buber; ontology of relationship. English title: Art of dialogue at café philo. The paper aims to present the proprium dialogicum of the café philo. In theoretical terms, the philosophical dialogue in the café philo can be recognized as discursive rationality and play of the faculties ruled by the logistikon, as an exercise of critical thinking, as an endless quest of meaning, and finally as a way of life. All those theoretical acquisitions are tested by the comparison with results from one year of praxis of café philo, part of the Diderot Project supported by the Fondazione CRT of Torino, conducted with more than 2.000 high-school students of Piedmont. Keywords: philosophical practice; café philo; dialogue; ethics; aesthetics. Kannst du zuhören? Kannst du sprechen? English title: Can you listen? Can you speak? On basic practical categories of dialogues in the mirror of gender and affect studies. This essay discusses our competence to listen and to speak in a way that allows us entering upon and staying in dialogue. The author derives his criteria from Martin Buber, who requires for a dialogue that either participant provides a radically open, unbiased and empathic attitude towards the other. Genderedness and affectiveness are among the structures which tend to prevent people from achieving a true dialogue. The author resorts to theories of Gender and Affect Studies for describing and analysing practical examples taken from his work in rehabilitation of people who experience mental illnesses. In all these examples striving for a dialogue in Buber’s sense promises to diminish the constraints forced on people by repressive gendered and affective patterns. Finally, the author refers to Sara Ahmeds “KillJoyFeminist” in order to highlight that speaking and listening does not mean to achieve a consensus but to keep in mind and respect difference. Keywords: Buber’s concept of dialogue; Affect Theories; gender perception of persons with mental illnesses.